I have one last Halloween makeup for you. It's one of my favorite characters of all time - Hello Kitty! I thought this would be a really cute last minute costume idea and it's super easy to do! Just a little bit of makeup, some white ears and a pink bow. Check it out! 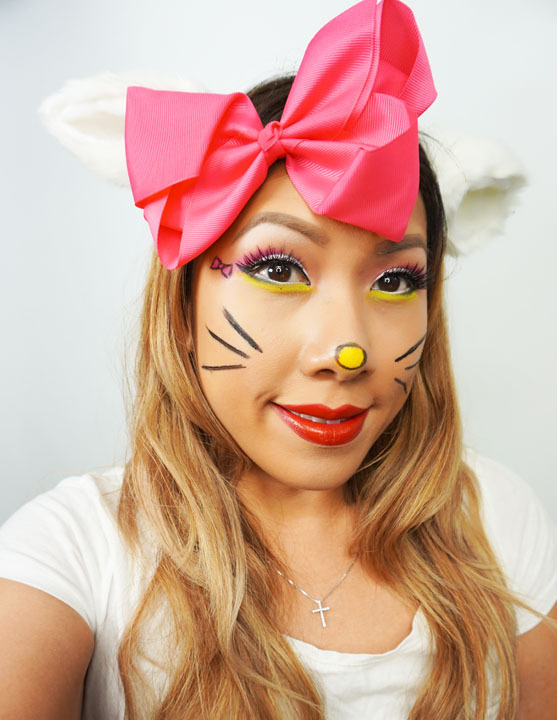 I copied the Hello Kitty Colors - White, Black, Hot Pink and Yellow. I did a fun glitter cut crease using this color scheme. A little button nose and some whiskers and you're done! 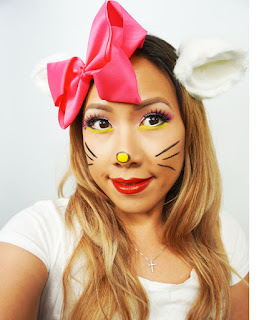 I would pair this makeup with a cut white dress and a pink bow around your waist - you can easily grab some pink ribbon to make the bow in your hair and as your belt. If you end up doing this look, tag me!